You are here: Home / Dogs / Is She Done Yet? If Mopsy does walk away early?and leaves a lot of food behind,?we’ll pick up her bowl and feed it to her in the kitchen while we’re having our own dinner. 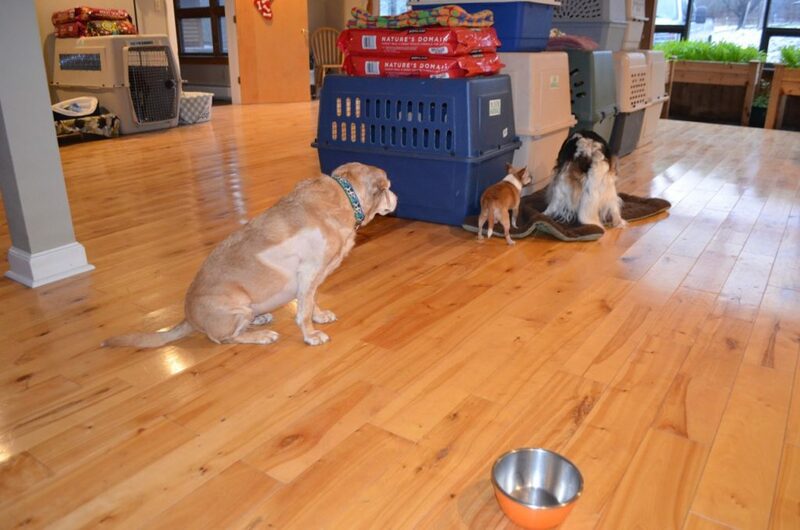 Most?dogs eat in their crates — I think you can see blind Stella in the giant crate by the door, having just finished and waiting to be taken outside — while others eat out in the room, like Darla and Mopsy. It has to do with how fast they eat, where they are most comfortable eating, whether they are likely to wander around the room bumping into other dogs who are eating, whether they will try to sneak in and “share” another dog’s dinner, etc. A few dogs, like Taco, Aurora and Sophie, eat dinner?later at night because of medication or other reasons. But, once Mopsy has finished, the patient ones eventually get their rewards! How you guys keep track of all these feeding arrangements, I’ll never know! But lucky for Mopsy AND Wilbur, you’ve got it all under control. Dinner sounds complicated at your house! Luckily you always have someone on hand to clean up any missed kibble. Ours are easy. Two wolfer-downers, separated by a gate. Dinner over in 60 seconds flat. I used to run a barn, and I would grain the horses twice daily&place them all according to: who wanted a buddy to be close while eating, who didn’t want anyone around them while eating, who ate slower, who ate faster, who needed supplements, etc, etc; so I understand a little bit of your food-management deal! With dogs I’m sure it’s a whole other “mess” entirely haha. But we can be sure of one thing- anything left behind is usually cleaned up quick!